Gulfport has a large exposure to the basin and currently has ~215,000 net acres under lease in the core of the dry gas, wet gas and condensate windows of the play. Gulfport holds a sizeable acreage position totaling approximately ~92,500 net effective acres in the core of the SCOOP. 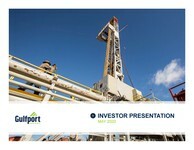 Please view our most recent investor presentation. Our Company is a value-driven, growth oriented oil and gas exploration and production company. Our corporate strategy is to internally identify prospects, acquire lands encompassing those prospects and evaluate those prospects using subsurface geology and geophysical data and exploratory drilling.